Broadcast major Kelsey Nixon (BA ’07) had little interest in being a newscaster. She wanted her own television cooking show. Two supportive broadcast faculty, Dale L. Cressman (BA ’85) and J. Robert Walz (BA ’82), agreed to help, and the result, Kelsey’s Kitchen, ran for two years (100 episodes) on iProvo cable TV. Nixon purchased her own ingredients, enlisted student assistance, and used laundry baskets to haul home dirty dishes. Three-and-a-half years later, Nixon’s desire for her own professional show became reality. Kelsey’s Essentials premiered on the Cooking Channel in November and is designed for the do-it-yourself cook. Nixon teaches about essential techniques and equipment and gives tips for creativity and success in the kitchen without recipes. It’s her dream-come-true job, but it has required ambition, focus, and talent. As a BYU student, Nixon snagged as much experience as possible. She interned for Good Things Utah, an ABC-affiliate morning talk show. She also studied at the French Culinary Institute in New York City for three months while interning at Martha Stewart Living. Within a month of receiving her BYU diploma, Nixon headed to California, where she earned a culinary arts degree from the Kitchen Academy in Holly-wood. She auditioned for a spot on The Next Food Network Star and made Belgian waffles as part of her tryout. 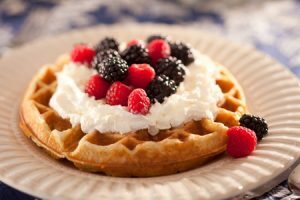 Waffles are one of her favorite foods, and she and her BYU roommates used to make them every Saturday and invite the neighborhood. Selected for the competition, Nixon was named the fan favorite. Although her fourth-place finish didn’t land her the cooking show she desired, she continued working toward her goal. While waiting for her husband, Robby M. Egan (BA ’09), to graduate in public relations, she taught cooking lessons, developed recipes for Zupa’s restaurant chain and the Shelf Reliance food storage company, and worked at a restaurant. With her fingers crossed for season two, Nixon says this kind of job will give her an opportunity to have a family and still chase her dreams. Much of her research is done at home, and multiple shows are filmed simultaneously. In a large mixing bowl, whisk together the buttermilk, egg yolks, vanilla, and butter until thoroughly combined. In a separate mixing bowl, combine the flour, baking soda, baking powder, sugar, salt, and cinnamon. Stir into the buttermilk mixture. In another bowl, whip the egg whites with an electric mixer until stiff. Fold into the batter. Spoon waffle batter onto the hot waffle iron, and cook until golden brown. Serve with fresh whipped cream and fresh fruit.